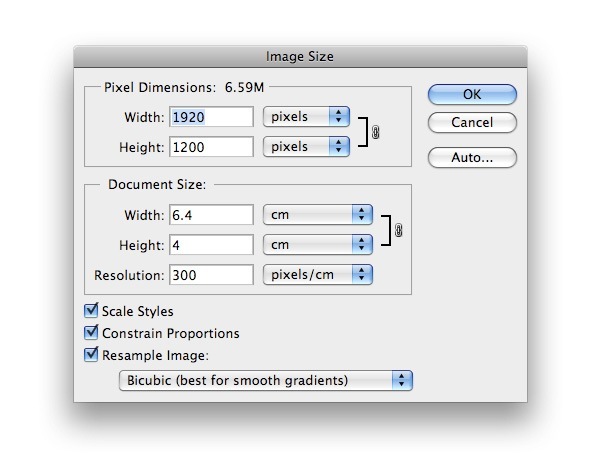 Start things off by creating a new document in Photoshop (Cmd/Ctrl + N) that’s 1920x1200px in size and with the Color Mode option set to RGB Color. 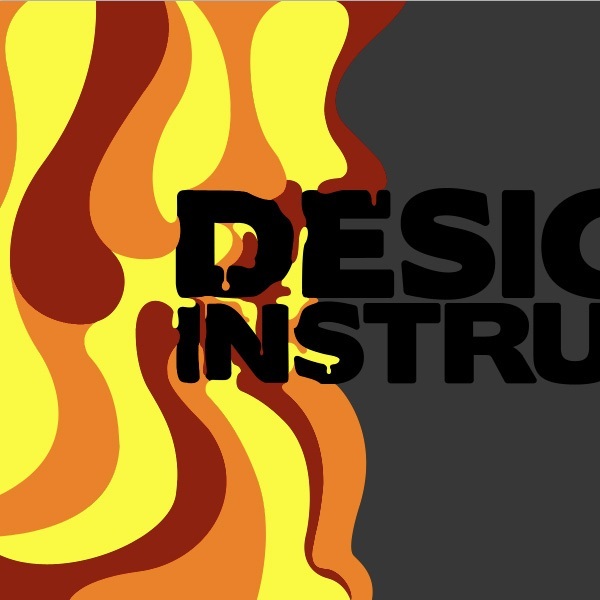 For the text, we will use the free Boris Black Boxx font. If you want to use your own font, feel free to do so. 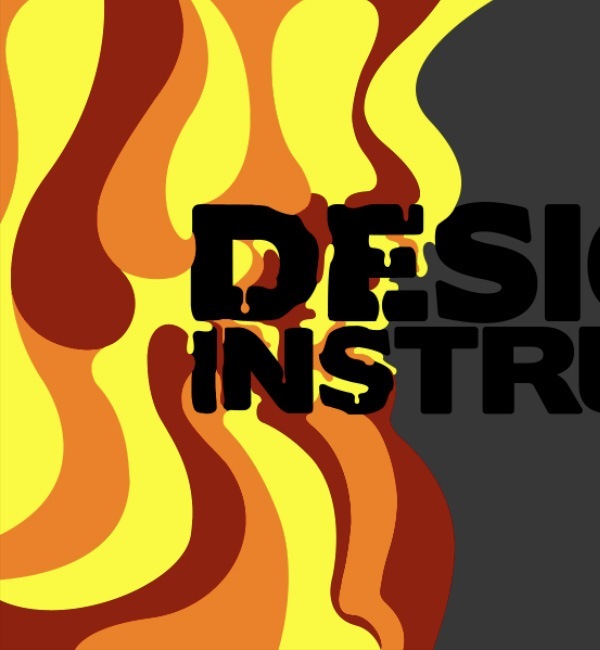 Use your Horizontal Type Tool (T) to type out a word of your choice; in this tutorial, we’ll use the word, "Design." For the font size, 24-26pt seems like a good size. 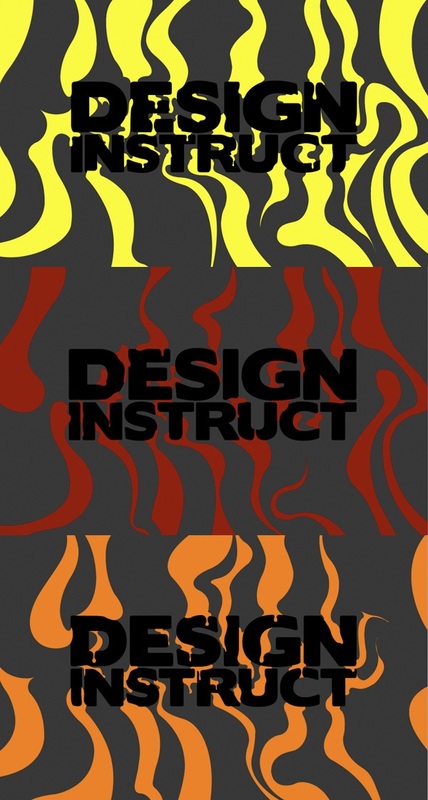 On a separate text layer, type out the word "Instruct". Use the Move Tool (V) to move the text below the first line of text. An easy way to kern your type in Photoshop is to place the mouse cursor between the two characters you want to adjust, hold down the Option/Alt key and then use your Left Arrow and Right Arrow keys to either move the letters closer together (Left Arrow) or further apart (Right Arrow). Let’s kern the letter "S" and the letter "T" in the second line. 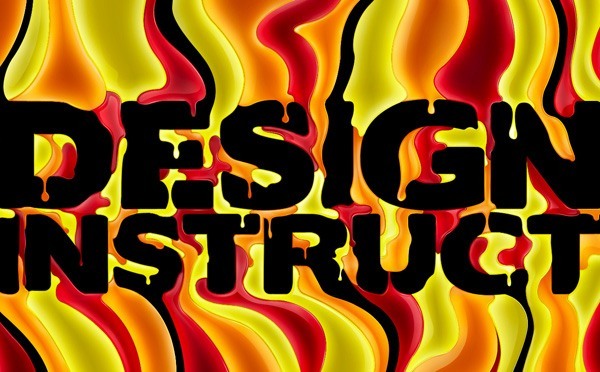 We want to make the space between the two letters tighter until it matches the spacing of the other letters. Once you’re happy with the kerning of your letters, we want to make sure everything is lined up nicely. To do this, we’ll use the Free Transform command. 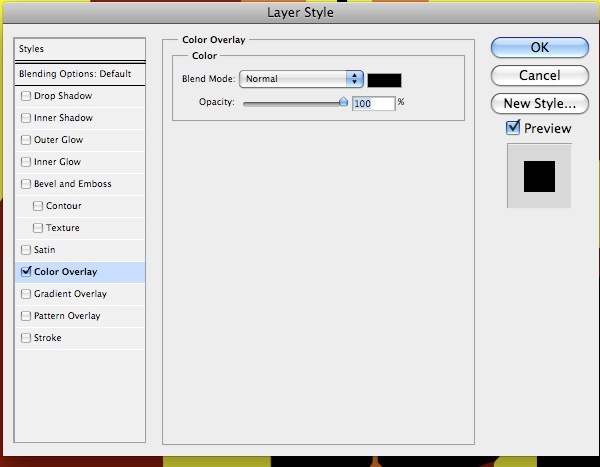 First, in the Layers Panel, click on the "Instruct" text layer to make it the active layer and then use Free Transform (Cmd/Ctrl + T) to make the adjustment. 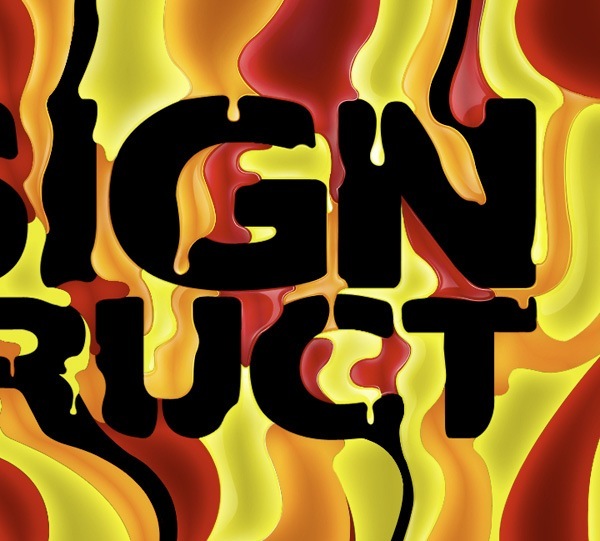 Hold down Shift to keep the resizing proportional and then drag the bottom-right transform control up and to the left until it lines up with the edge of the first word. Zoom in if you need to and just make sure that the text is centered and everything lines up. 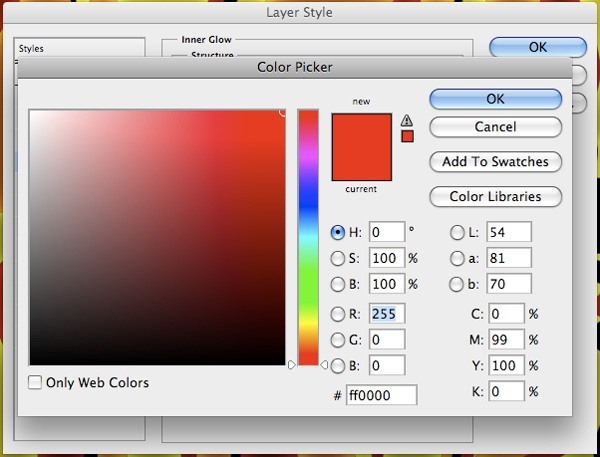 In the Layers Panel, unlock the Background layer by double-clicking on it (this will reveal the New Layer dialog window when the layer is locked – just press OK in that window). Afterwards, double-click the layer again to bring up the Layer Styles window. 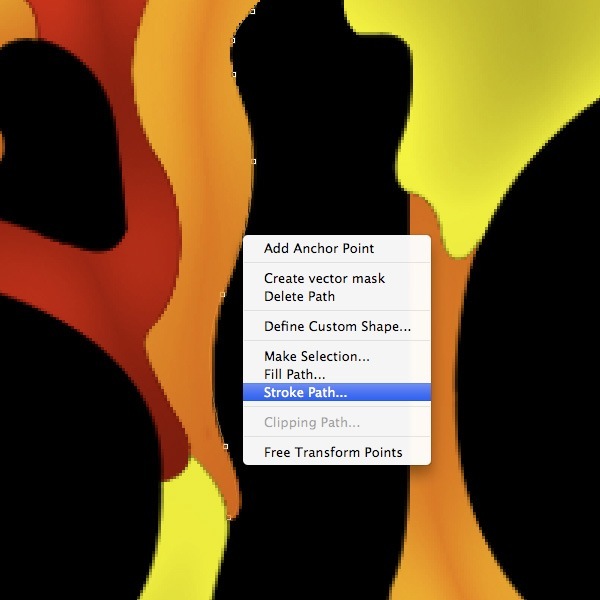 Switch to your Pen Tool (P) and make sure that you have it set to Paths mode, which you can do in the Options Bar that’s usually located at the top of the Photoshop workspace. 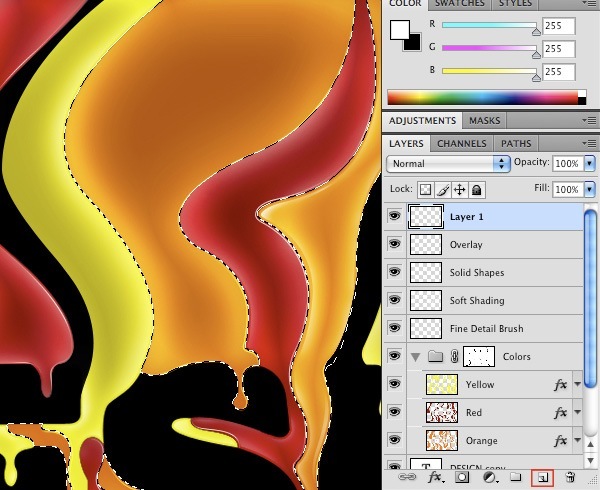 On the new layer, begin to draw a curvy shape on the left side of the canvas. It doesn’t have to be exactly like mine below, but do go for something that has a natural, flowing, liquid, smooth feel. Close your path, Control-click/right-click anywhere along the path and then choose Make Selection in the contextual menu that appears. 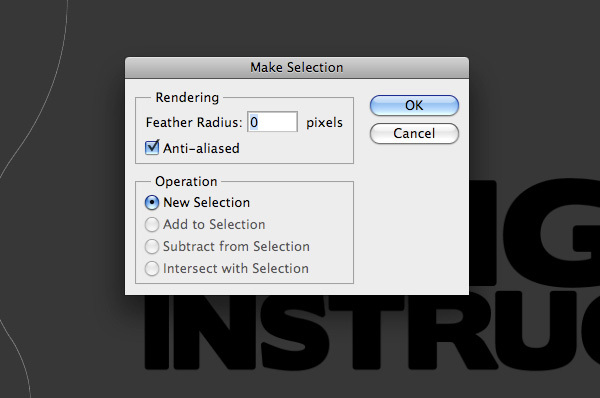 This will open the Make Selection dialog window; feel free to just press OK and leave the default settings as is. You should now see a selection around the path we drew. 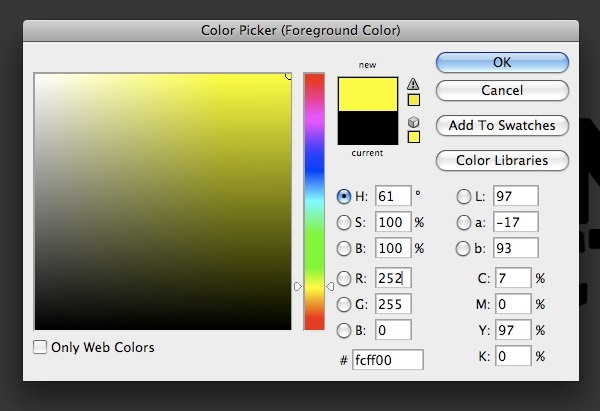 Switch to your Paint Bucket Tool (G) and use a vibrant yellow color (#fcff00) to fill in the selected area. Once you have filled the shape, press Cmd/Ctrl + D to deselect the shape. 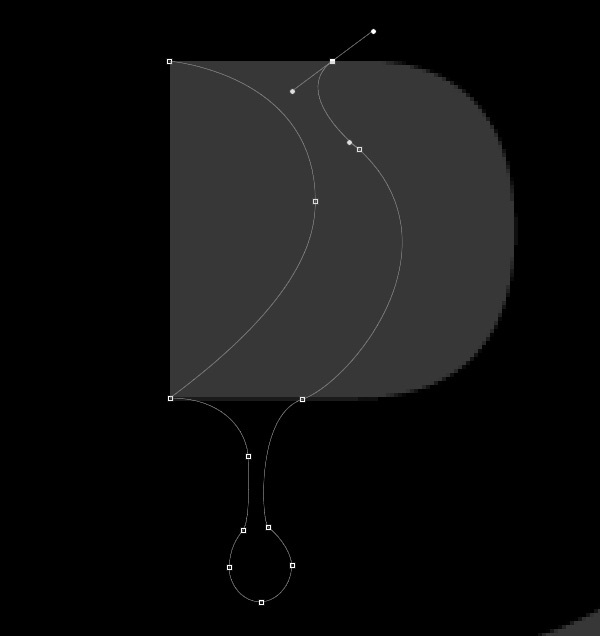 Create a new layer above your first shape layer and, with the Pen Tool (P), begin to create another curvy line above the letter "D" in our first word. 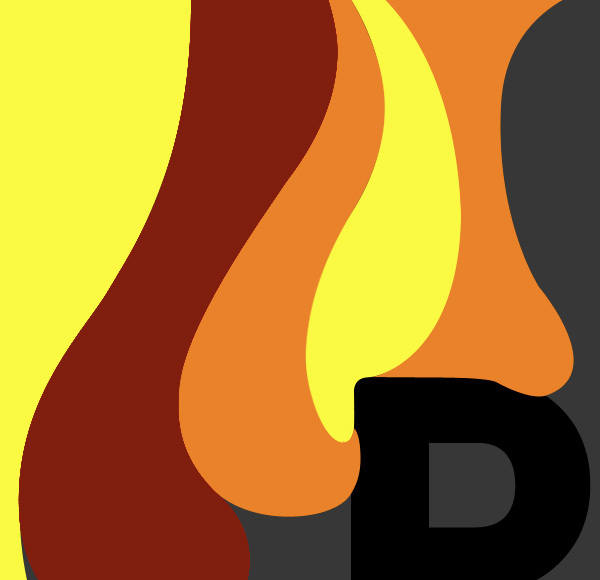 Let the shape overlap the letter a bit and have it follow the general shape of the letterform. Continue the path and make the shape wrap around the top of the letter and then bring it back up to the top. 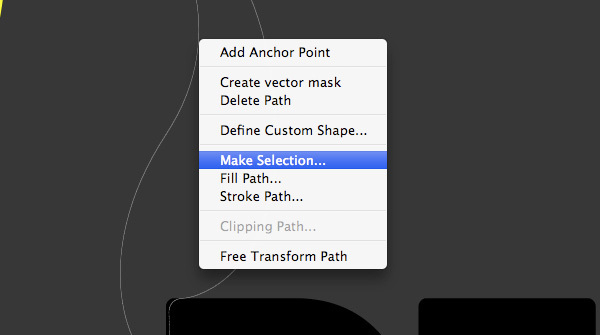 Make a selection around the path just like in the previous step. 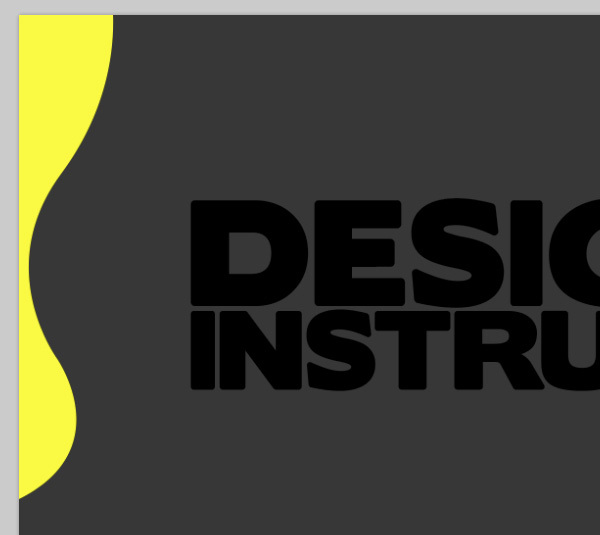 Once your area is selected, fill the shape with the same yellow color using the Paint Bucket Tool. 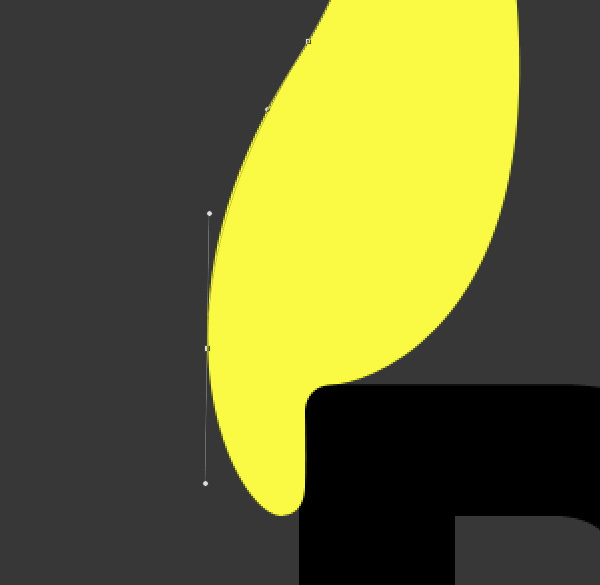 If you’re happy with the two shapes, go to Layer > Merge Down (Cmd/Ctrl + E) to merge the layer of the second shape with the first yellow shape we drew in the previous step. Now we want to concentrate on the space between the two shapes that we’ve just created. 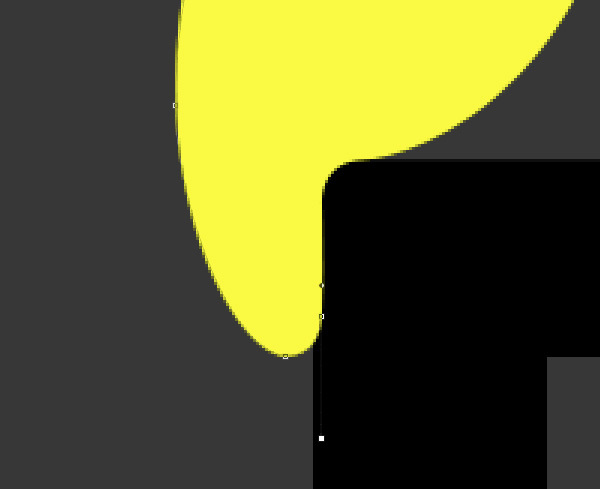 To do this, we’ll make a new layer above the yellow shapes layer and, with the Pen Tool, begin to trace around the second shape. Zoom in if you have to. Be mindful of the way the shapes flow and wrap around each other as you trace around them. Curve the shape so that it comes back upwards towards the top of the canvas. Close the path, make a selection around it, switch to your Paint Bucket Tool (G) and fill the area with an orange color such as #ff8400. Press Cmd/Ctrl + D to deselect your selection. 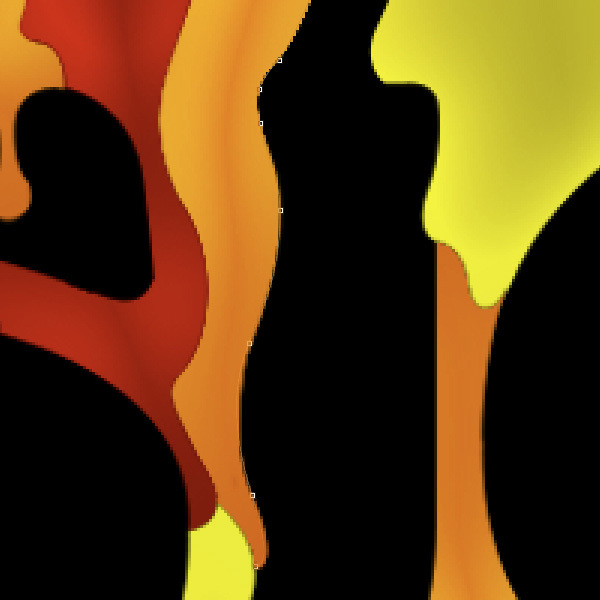 We’ll be keeping our colors on separate layers so that we can more easily modify them individually later on. 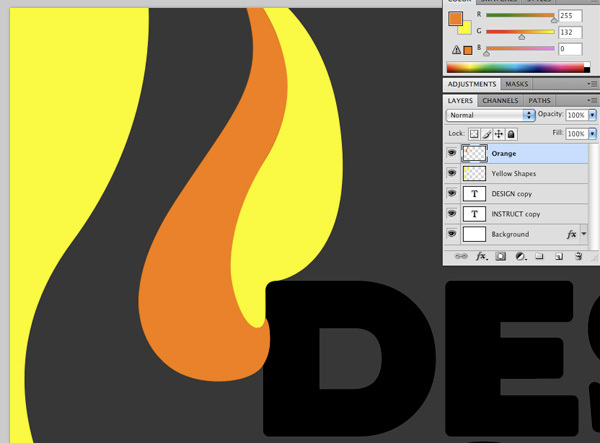 The image below shows you how my layers are organized thus far (yellow shapes on one layer, orange shapes on another). 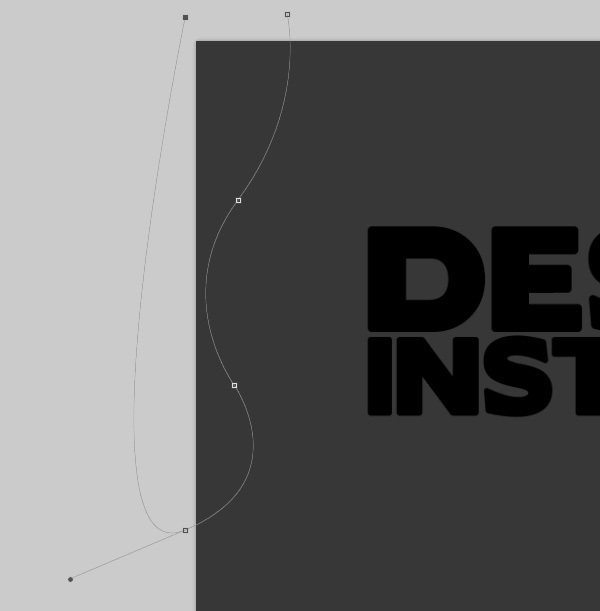 Create a new layer and begin to trace between the other shapes to fill in the area with your Pen Tool (P). We want to round the shape off so that it looks like it’s dripping and being pulled downwards. 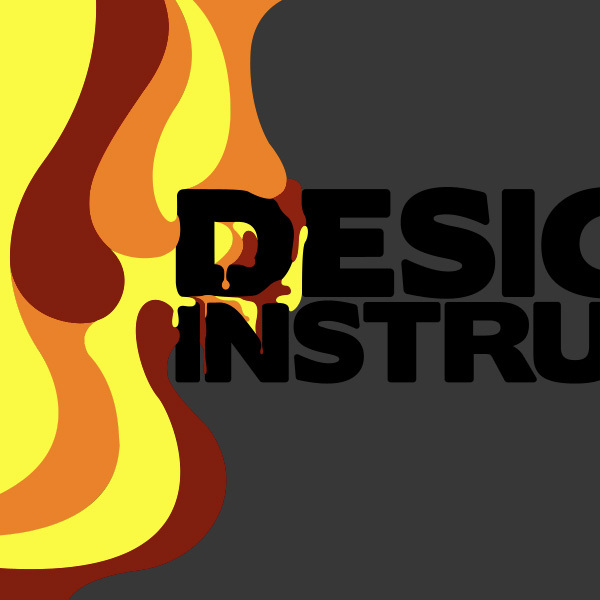 Use the same process as in the previous steps to fill in the shape with a deep red color (#7f0000). Now we’ll begin to focus on the spaces between each of the letters. 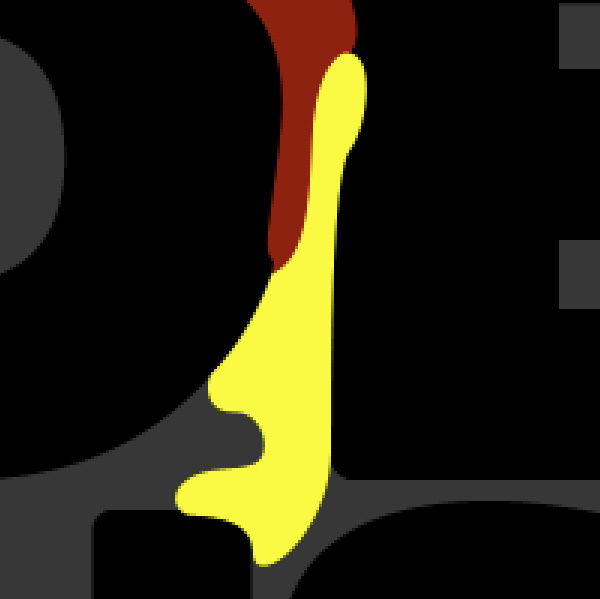 With your Pen Tool (P) selected, make another path that’s smaller and that wraps around the edges of the two letters in a natural way. 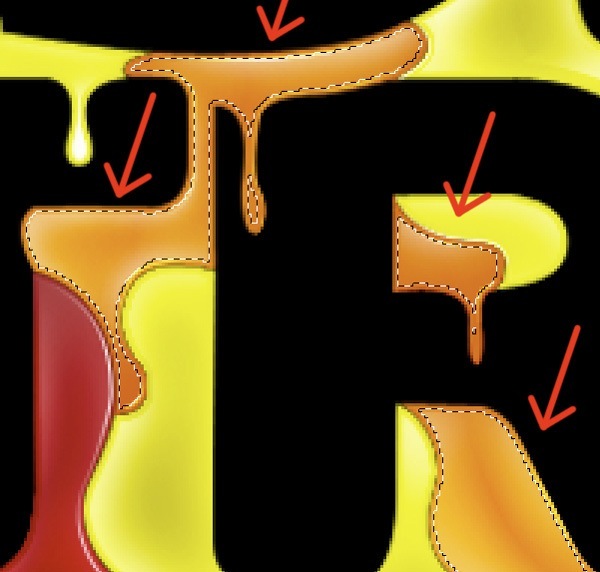 Imagine that a thick, viscous liquid substance (like paint) is being poured on top of the words as you continue to make your shape. 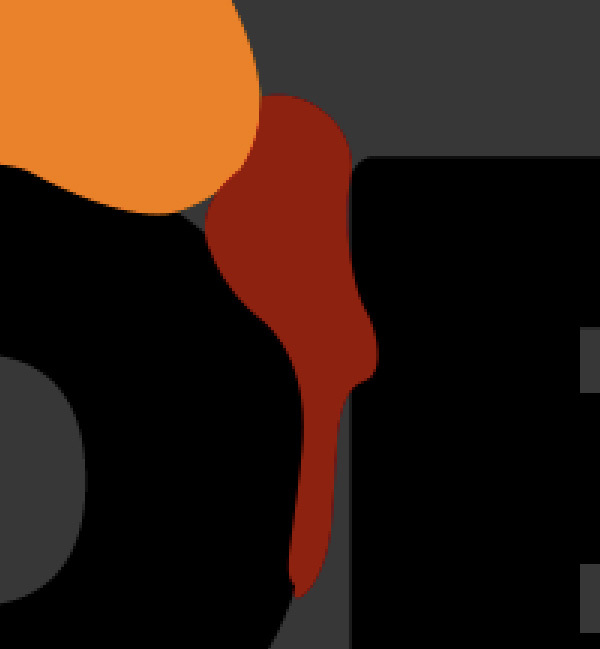 Fill this shape in with the same deep red color that we used earlier and then you can merge down this layer (Cmd/Ctrl + E) with the other red shape layer. 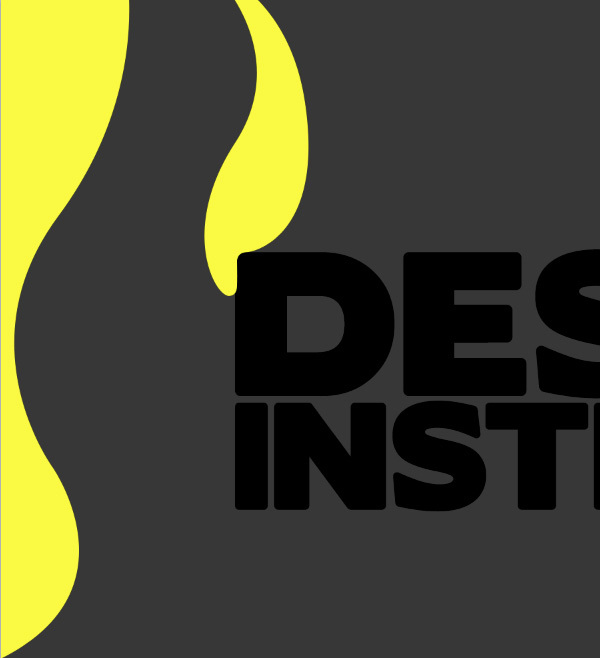 Make a new layer and then create a shape that connects to the previous one and comes downward over the letter "I". Fill this layer with yellow, keeping in mind that you want to vary the colors enough so that we don’t have two of the same colors next to one another. Another area that we’ll need to focus on are the negative spaces inside of certain letters (called counter or aperture in typography). 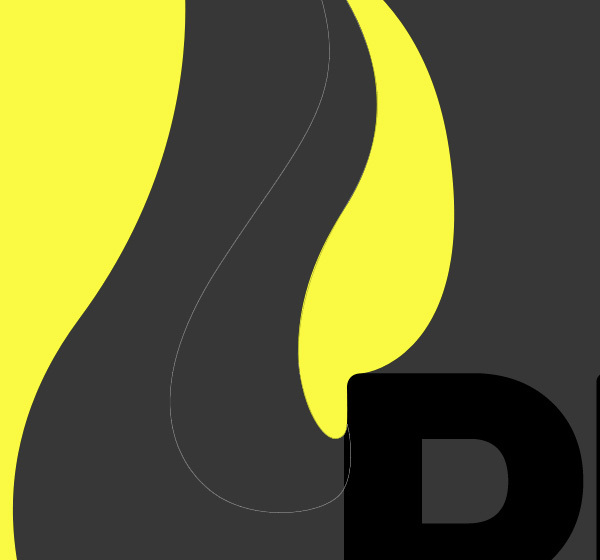 Create a new layer and, with your Pen Tool (P), make an anchor point on the upper-left of the space inside of the "D" in our first word. 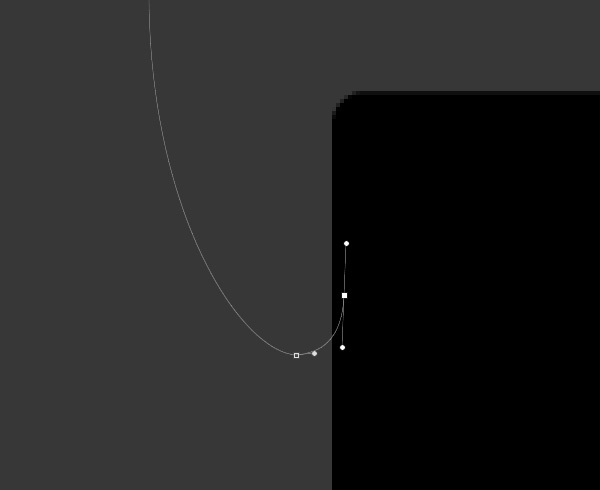 Next, create a second anchor point somewhere in the middle of the shape so that it makes a smooth curve. Notice how there’s a long handle attached to the second point that is stretching downward. 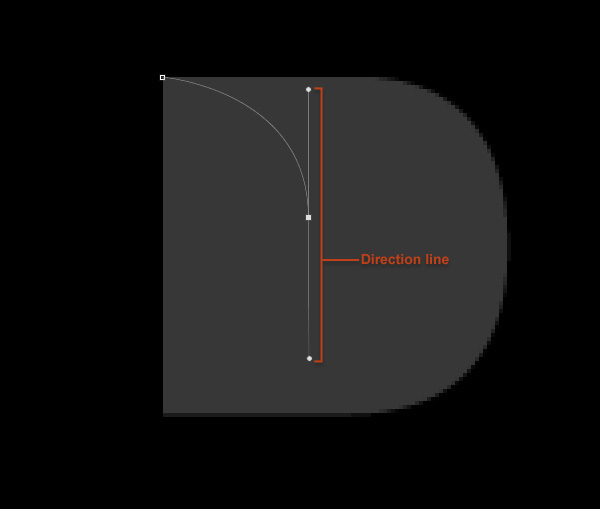 This is called the direction line in Photoshop, and you can use it to adjust the curve of your path. This handle will affect the sharpness or roundness of your curve. As it is now, we would have a pretty drastic curve happening, so what we can do to make it more natural is hold down the Option/Alt key and hover our mouse over the bottom point of the direction line. You will see that the mouse cursor changes. Click-hold-and-drag on the bottom of the direction line and move it around freely. This can take a bit of practice but, by dragging on the ends of the direction line, you can create just about any type of curve you need. 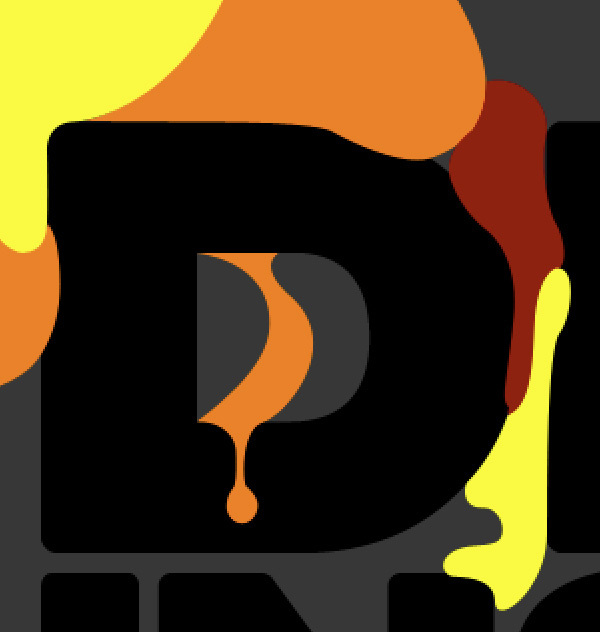 Create a drippy shape that overlaps the bottom bar of the letter "D". Bring this shape around and back and then up to the top. Close your path and then fill the shape with an orange color using the process we’ve used in previous steps. 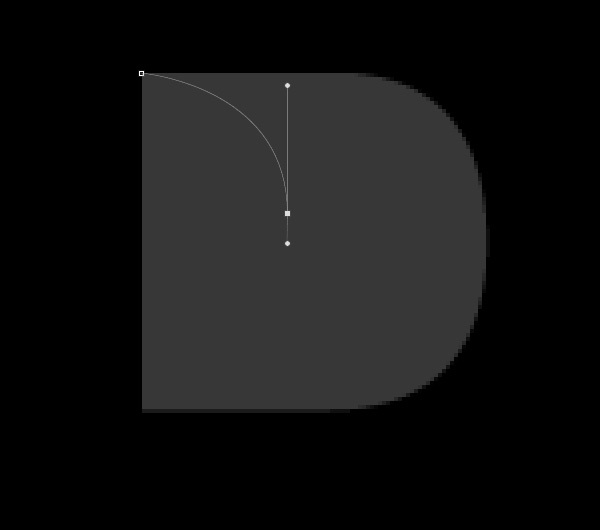 Proceed with making some additional shapes to fill the remaining space inside of the letter "D" counter. 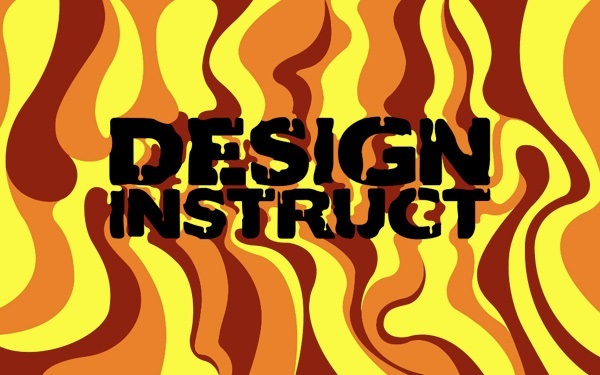 Remember to vary the colors to provide contrast and rhythm in your design. At this point, we have a few large shapes as well as a few smaller, more intricate shapes inside of (and between) each of the letters. We want to add a few mid-sized shapes as well, so that we have varying sizes as we move along with our work. 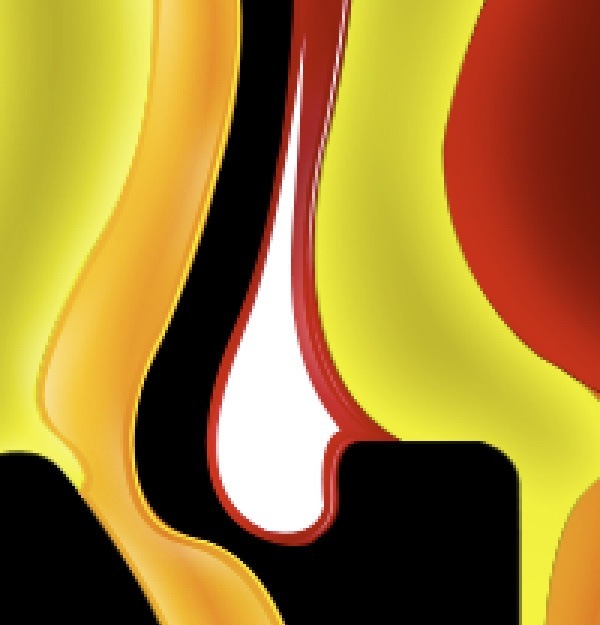 I continued to create more fluid shapes. There’s no right way to doing this, just have fun and get some practice with the Pen Tool (P). As you work your way across, you can begin to fill in the areas between the lines, as well as the areas between the letters. Connect the letters using various shapes that you can create with the Pen Tool (P) just as we have done in the previous steps. 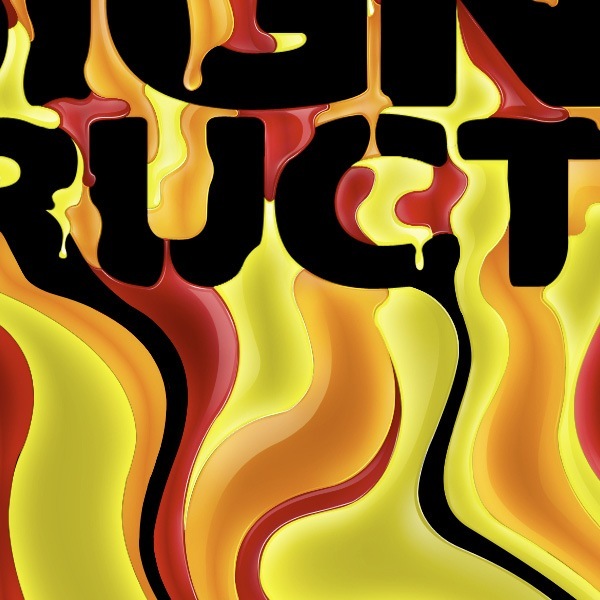 You will see the design starting to take shape as we have some drips overlapping different letters, and wrapping around others. So far, we’ve been using the Pen Tool (P) quite a bit, and we’ll continue to do this to fill in the remainder of the canvas with organic shapes and colors. 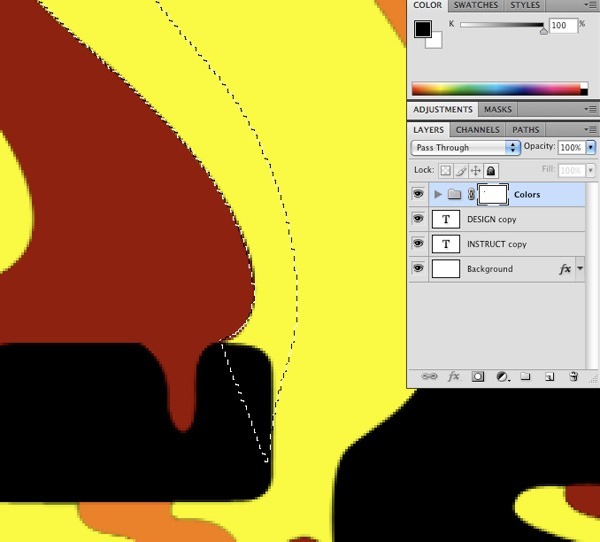 Make sure to keep your layers organized by color as well so that once we have finished tracing the shapes we can easily isolate all of the similarly colored layers in our design. After spending a bit of time working on the shapes and going for a smooth and natural feel, we can start to see how nice our image is starting to look. Continue to use this process to finish off the remaining areas so that everything is filled in except for our letters. 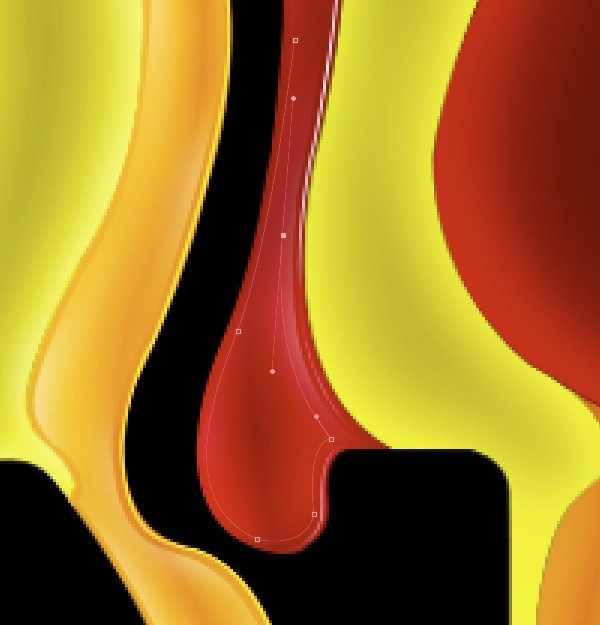 At this point, we have covered our canvas with these colorful, flowing liquid shapes and we should have three separate layers for our colors. 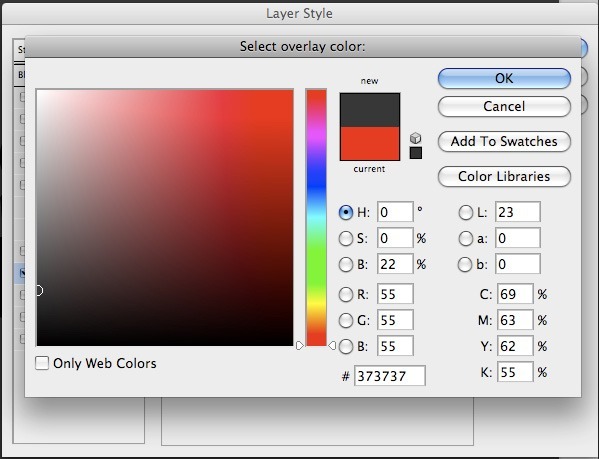 The image below shows each of these layers. 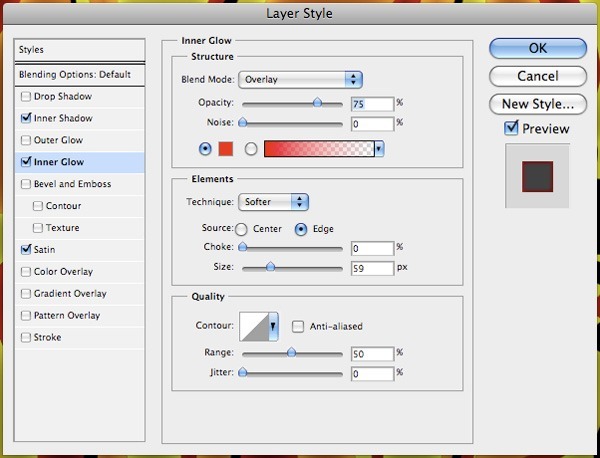 In the Layers Panel, select all three layers containing our drippy shapes, then click on the Create a new group icon (or press Cmd/Ctrl + G) at the bottom of the Layers Panel. 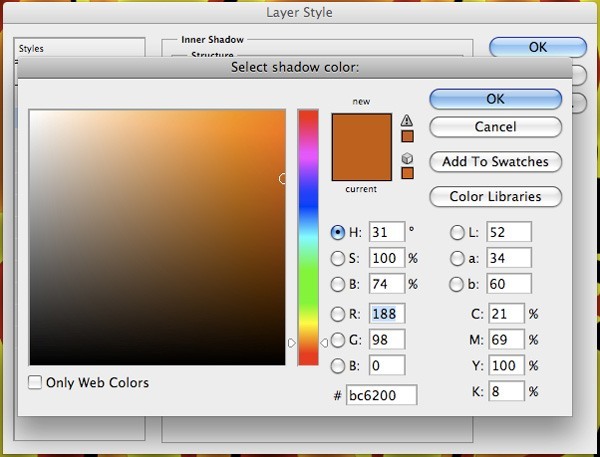 Let’s name this layer group as "Color". 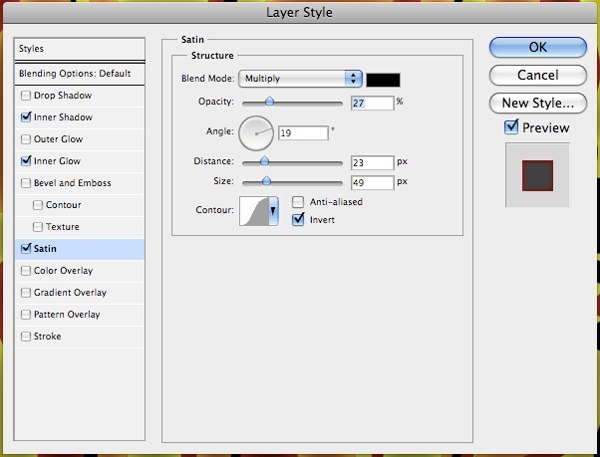 Once you have the layers inside a layer group, give the layer group a layer mask by clicking on the Add layer mask icon at the bottom of the Layers Panel. With the "Color" layer group highlighted in the Layers Panel, begin to draw some additional flowing shapes coming off of the letters using your Pen Tool. Next, close your path and make a selection around it. 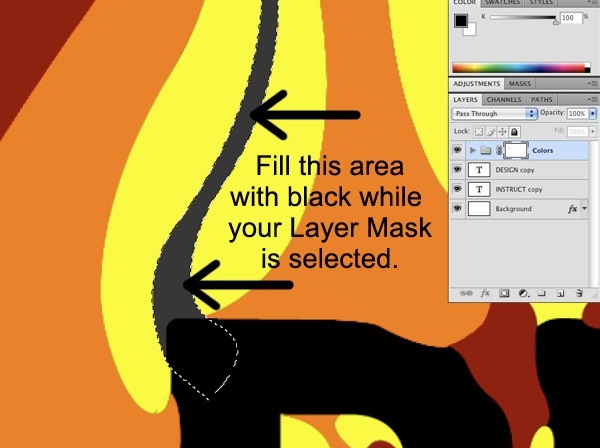 Switch to your Paint Bucket Tool (G) and, in the layer group’s mask, fill in the selection with solid black (#000000). 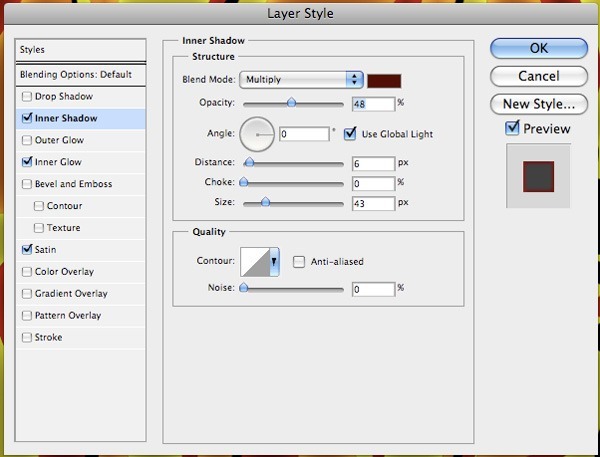 In layer masks, using black hides the selected area. You’ll notice that we can now see the background through this shape. Now that you can see what is being affected when we mask out these additional shapes, we want to just quickly change the background color so that it matches the fill of our letters. 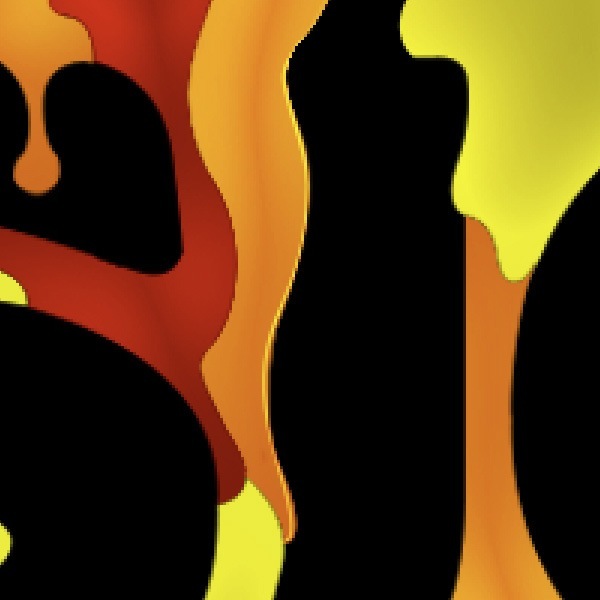 To do this, double-click on the Background layer to bring up the Layer Styles window and then give the layer a Color Overlay layer effect using black (#000000) as the color of the overlay. 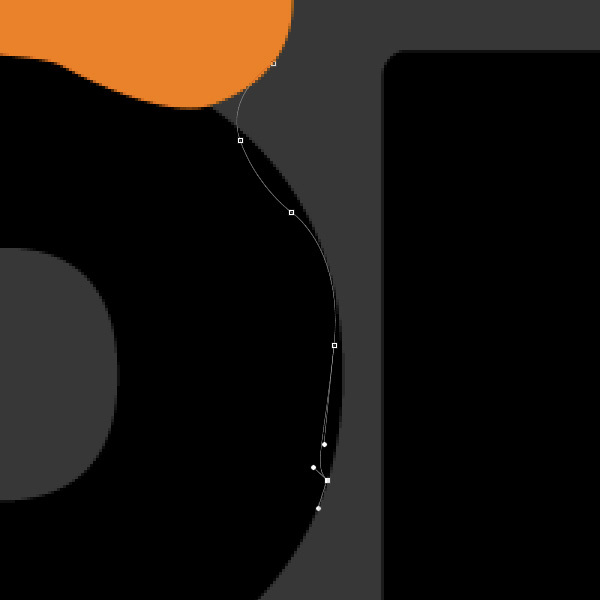 Continue to draw more shapes coming off of the letterforms with your Pen Tool (P) and try to make them look smooth like we have done with the previous shapes. 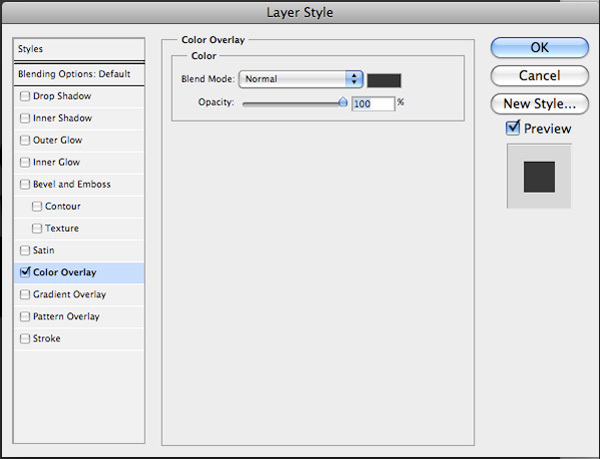 With the layer mask being the active layer in the Layers Panel, fill your selection with solid black so that the background is revealed. 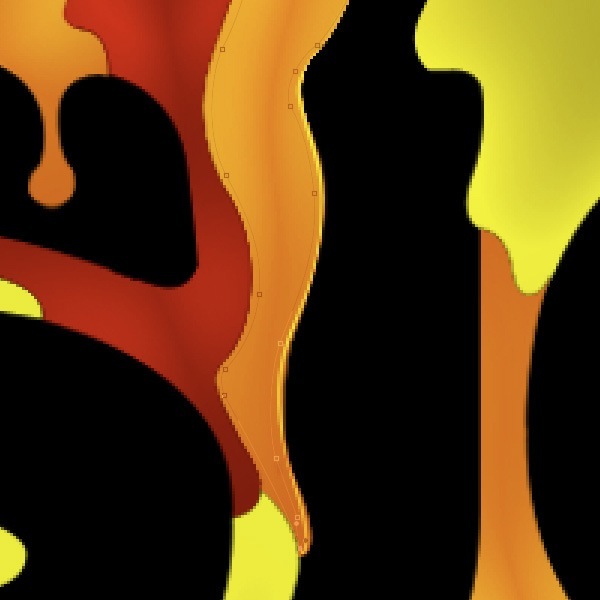 After making a few more selections, we now have a few streaks where the letters appear to be bleeding off of the page in a fluid motion. 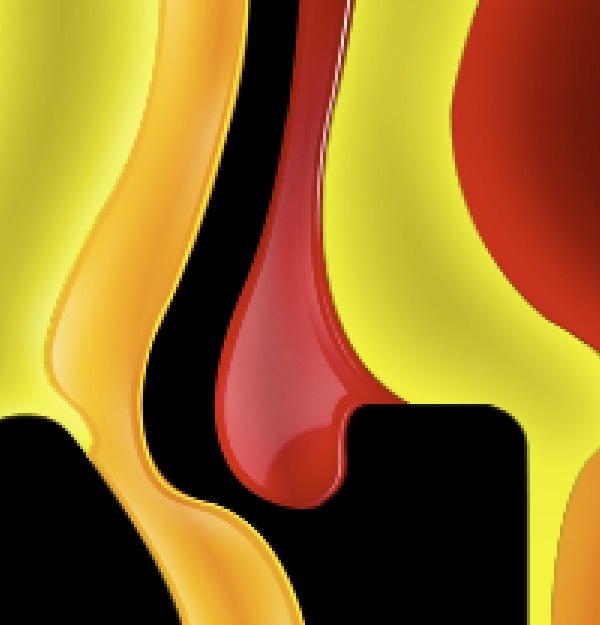 This also helps to break up some of the color and adds to the drippy effect that we’re going for. Double-click on the yellow color layer inside of our "Color" layer group to bring up the Layer Styles window. 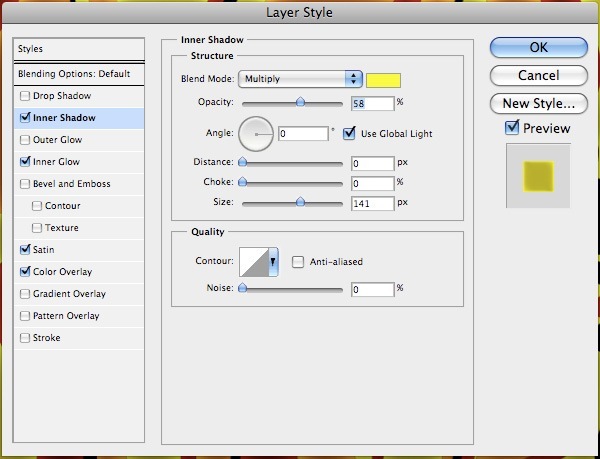 Give the layer an Inner Shadow, Inner Glow, Satin and Color Overlay layer effect. 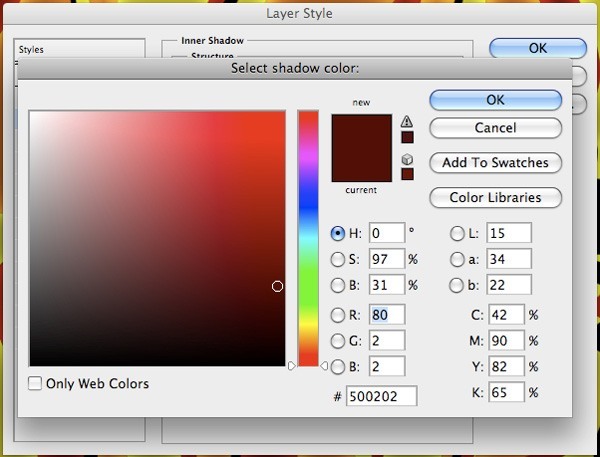 Let’s now give the red layer a layer style that consists of the Inner Shadow, Inner Glow and Satin layer effects. We just have one more layer to apply some effects to, so go ahead and double-click on the orange layer and apply the following layer effects. 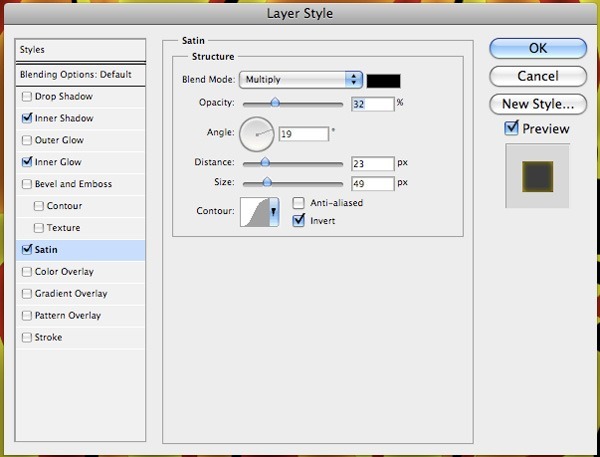 Let’s take a quick break so that we can discuss and review the layer styles we have applied in the previous steps. 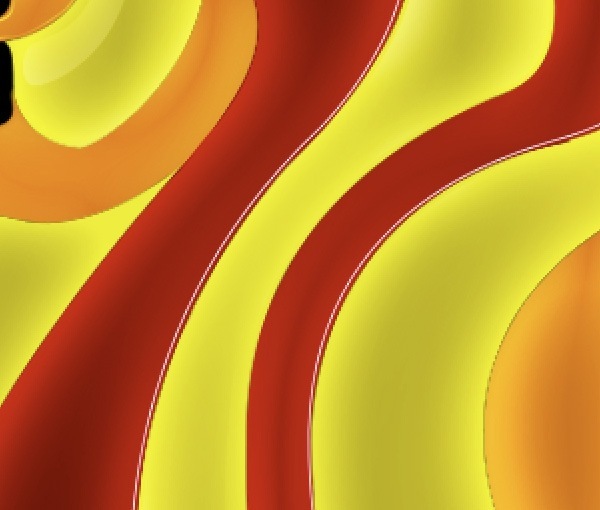 You may have noticed that I used a yellow color to highlight the orange, and that some of the settings for the orange or red are different from the others. 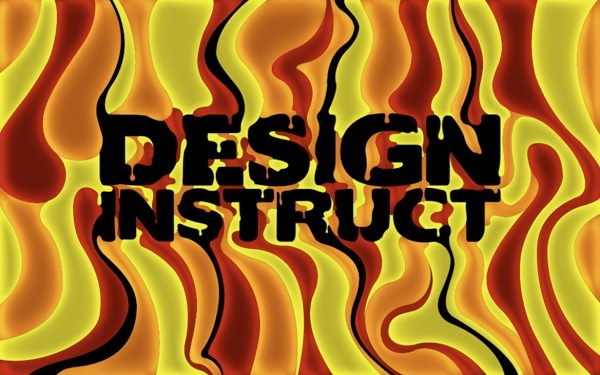 The layer style settings we used in the previous steps are to emulate the effects of airbrushing, or dodging and burning techniques. 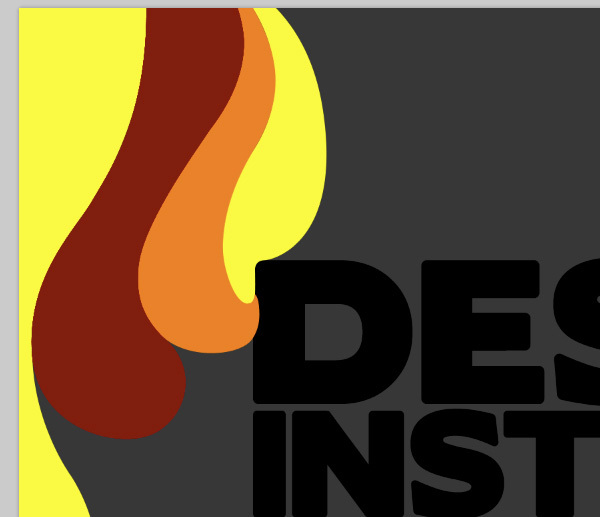 The layer styles really help add more depth and realism to the design. We could have also done this manually with the Brush Tool, but we can achieve the same look in a fraction of the time. Without the layer styles, as shown below, all of our colors look very flat and are lacking any kind of variation in tone and value. 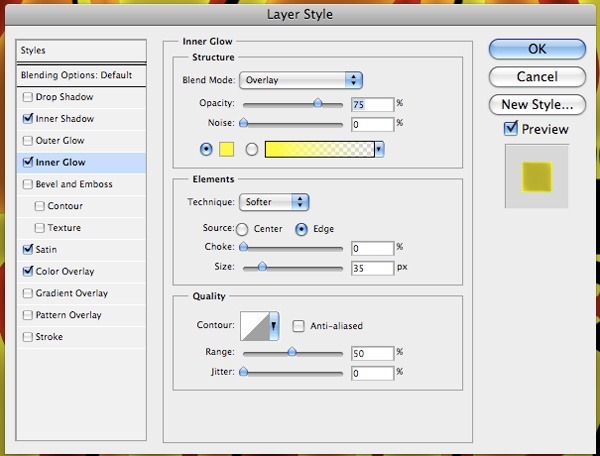 With layer styles, shown below, you can notice a major difference. The image really starts to come to life and jump off the canvas. All of our shapes have now become forms with shadows and highlights, which both help add quite a bit of depth to the piece. 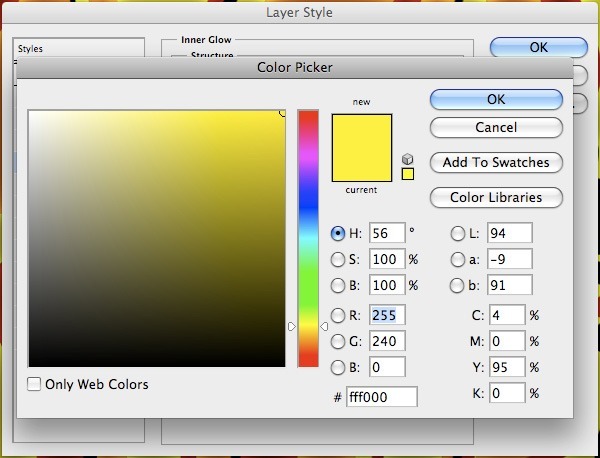 Create a new layer and make sure that it’s placed above your "Color" layer group. 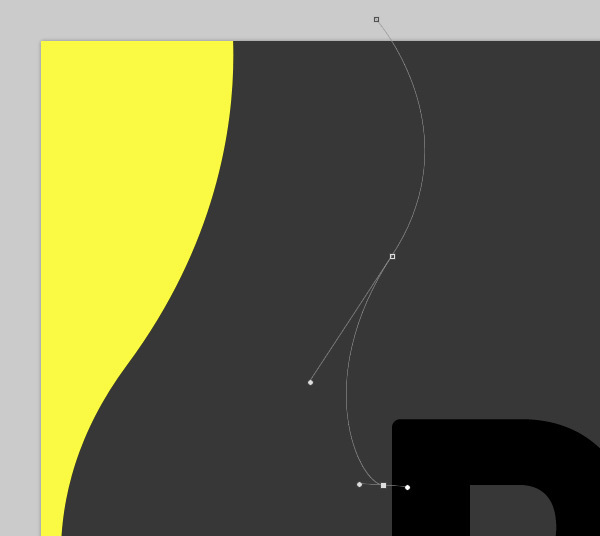 Switch to your Brush Tool (B) and use the Options Bar to set up the tool so that it’s set to a hard round 1px brush. 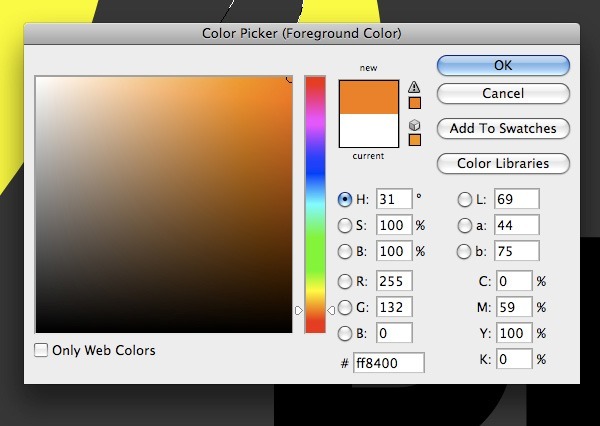 Change your Foreground color in the Tools Panel to white (#ffffff). 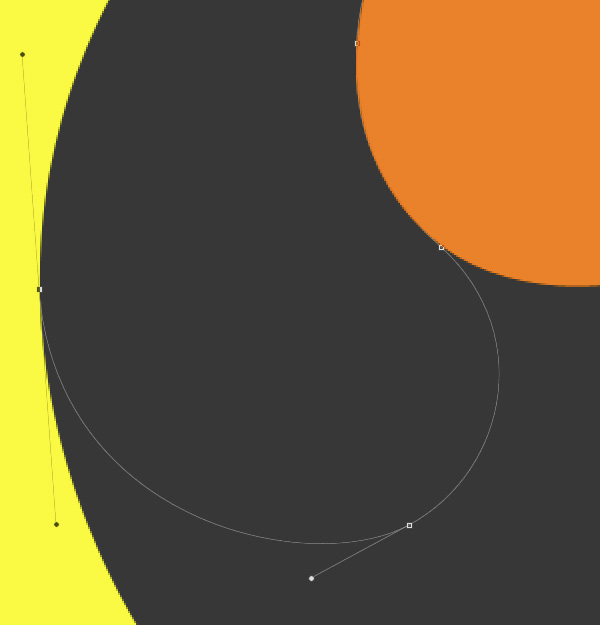 Next, switch over to your Pen Tool (P) and begin to follow the contours of any of your shapes. 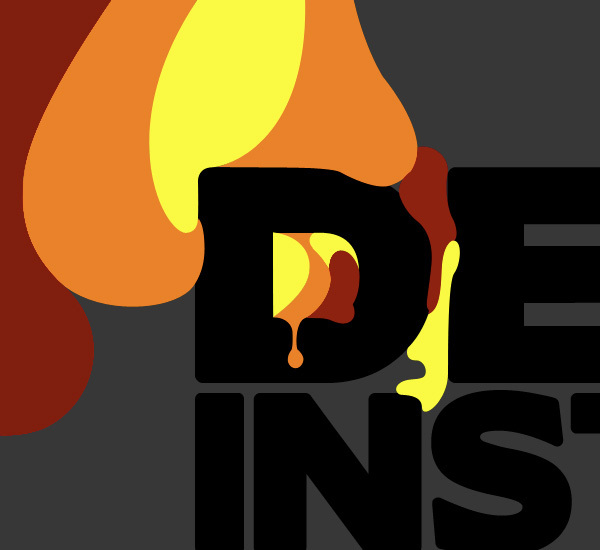 In this case, I decided to start around the shape of the "I" and basically just traced over the shapes that have already been created. 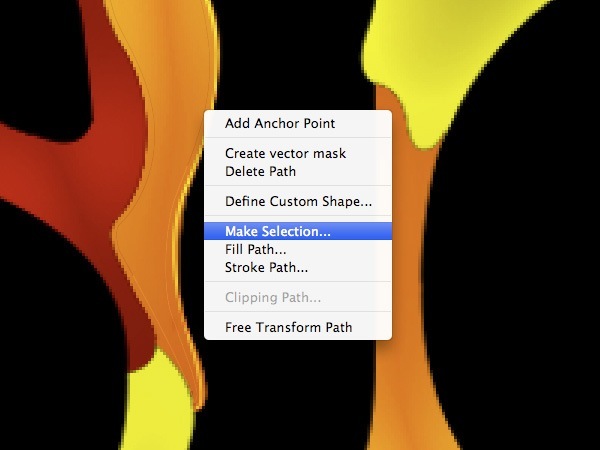 We don’t have to close the path to create a shape, but we just want to add some highlights to the edges. 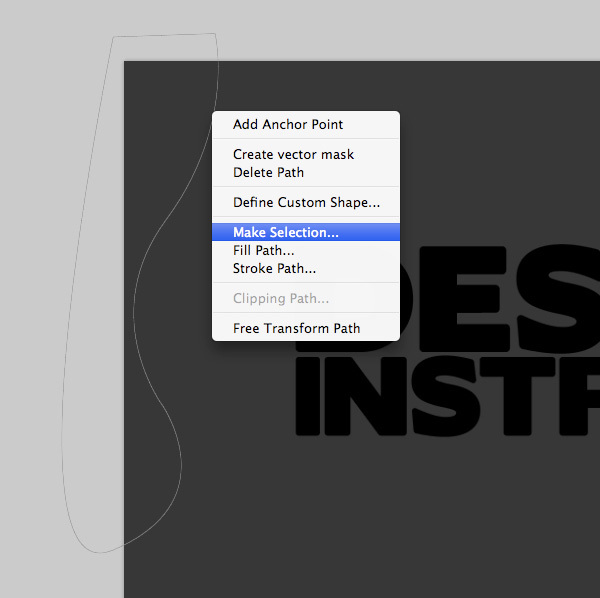 Once you have a line that follows along the side of the shape, Control-click/right-click on the path and then choose Stroke Path from the contextual menu that appears. 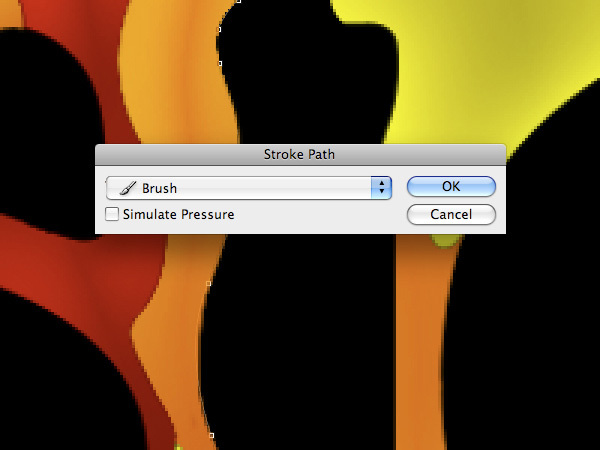 In the Stroke Path window, choose Brush in the dropdown menu and make sure the Simulate Pressure option is unchecked. After the path has been stroked with the Brush Tool, we don’t need the path anymore, so go ahead and Control-click/right-click on the path again and then choose Delete Path from the contextual menu that appears. 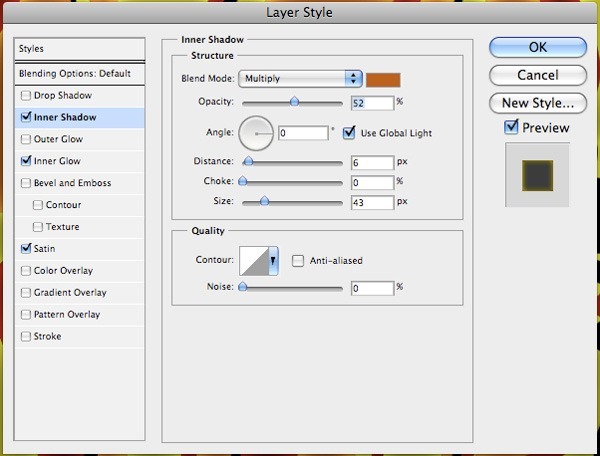 Next, change the Blend Mode of the layer to Overlay. Repeat this step for the other shapes. Experiment with different layer blend modes; some may look better using an Overlay Blend Mode while others can be left on Normal. 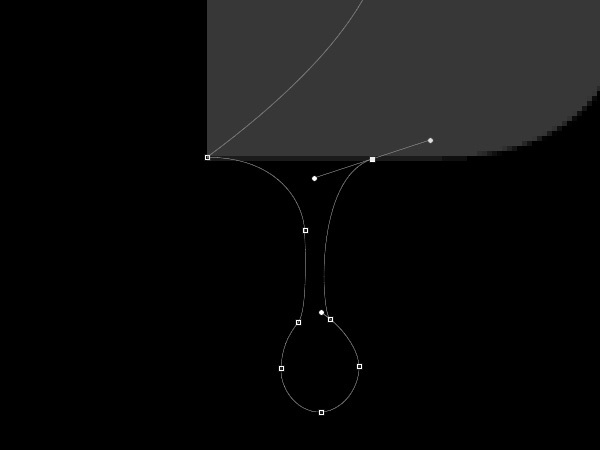 Switch to the Pen Tool (P) and then trace around the inside of the shape, this time closing the path. Once you have closed the path, Control-click/right-click anywhere on the path and then choose Make Selection in the contextual menu that appears. 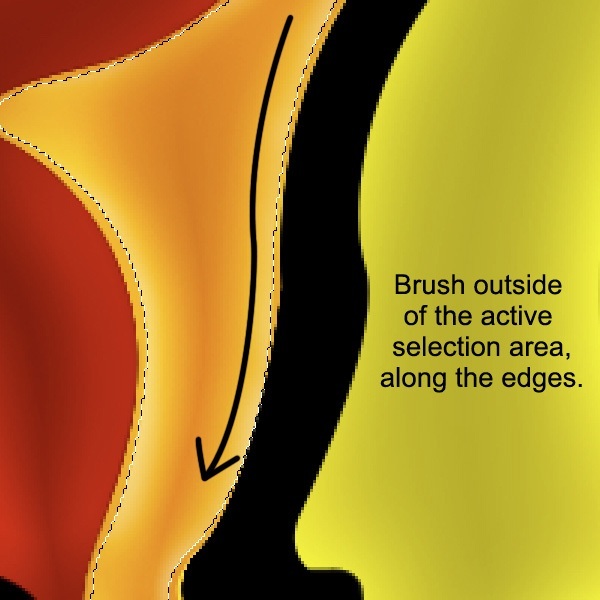 Switch to the Brush Tool (B). 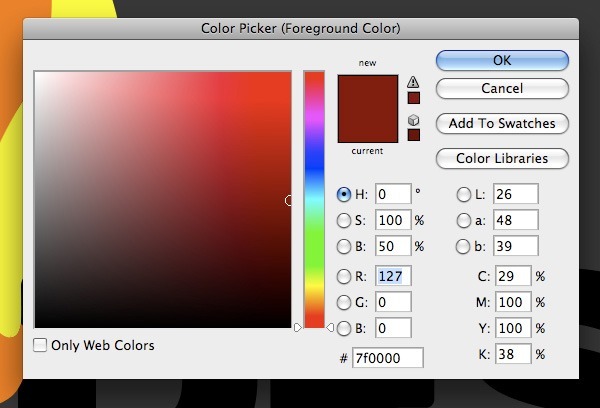 Make sure your Foreground color is set to white (#ffffff). Set the Brush Tool to a medium-sized (20px) soft round brush. Brush just outside the edges of the selection. This useful airbrushing technique can be used to highlight certain areas. Generally, the darker areas will recede into space, and the brighter areas will appear to jump out and come forward. 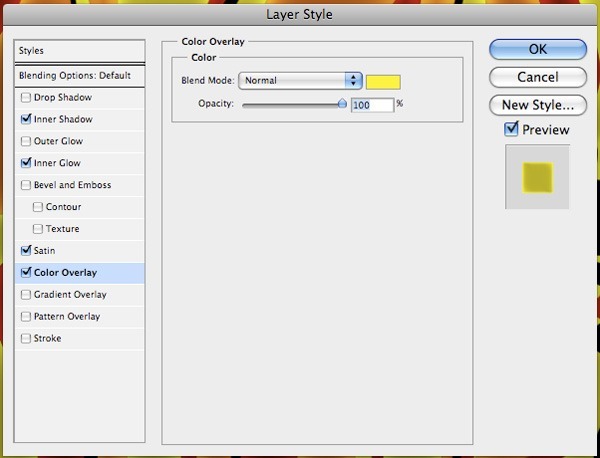 Create a new layer at the top of the Layers Panel. 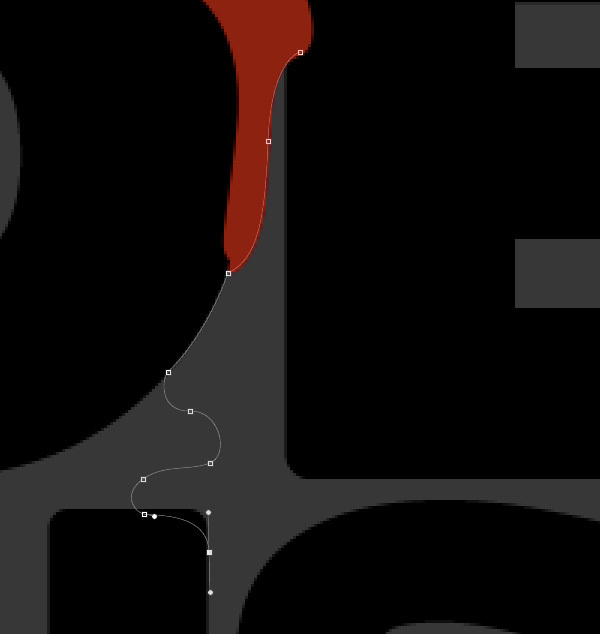 With your Pen Tool (P), draw a path that follows the general shape of one of your red drops. Make a selection out of your path (you should know how to do this by now) then use the Paint Bucket Tool (G) to fill the selection with white. Once you have done that, deselect the selection (Cmd/Ctrl + D) and then erase or mask out some of the hard edges to blend the shapes together. Using the techniques described in the previous steps, begin to work on the overall composition by adding highlights to all of the shapes. 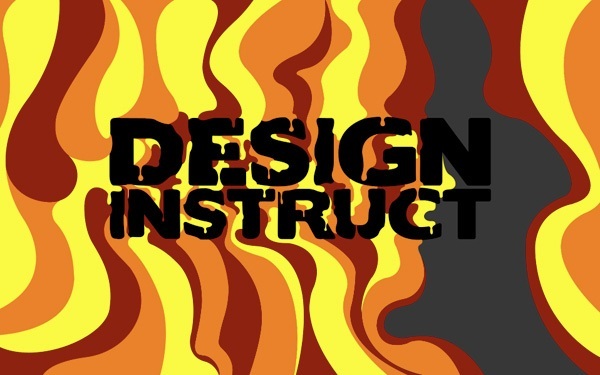 You can spend as little or as much time on this as you would like, but at this stage, the basic idea is just to have fun and start to add some details to your design. 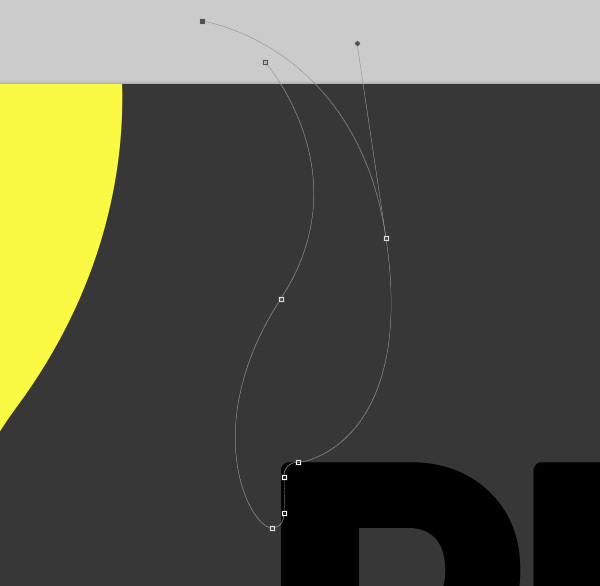 In some areas, you’ll want to create thin lines and have some of them set to Overlay Blend Mode while keeping others at Normal. 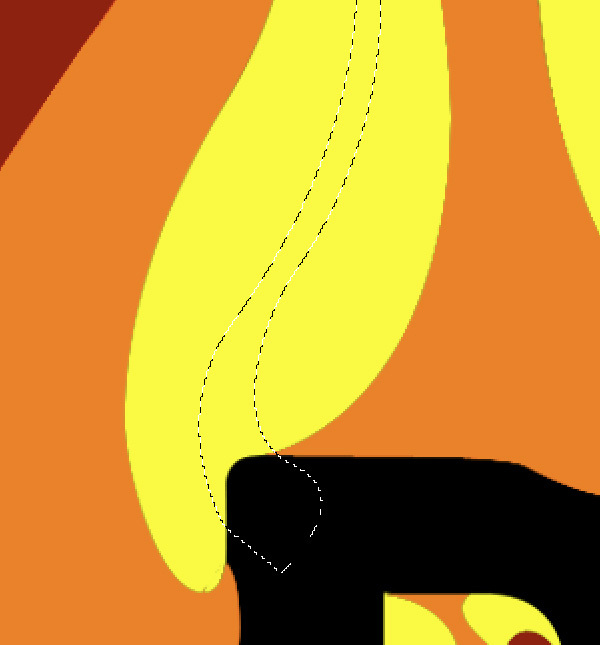 The image below shows a close-up of some of the areas where I have added some thin lines to add depth; these lines have a Blend Mode of Normal. 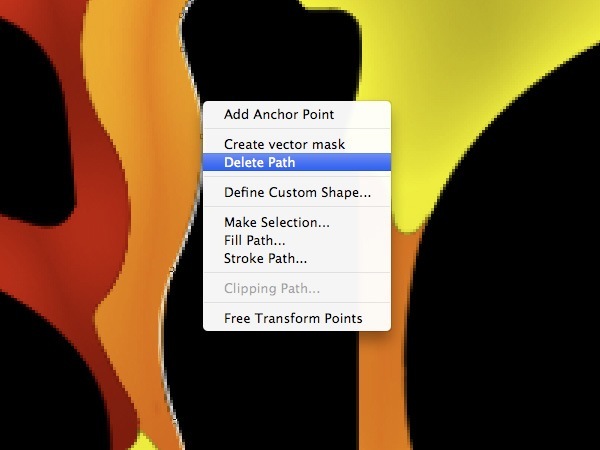 Keep on adding more lines and airbrush highlights onto your shapes. Zoom in and out to see how things are looking – this will help us achieve balance within our design. 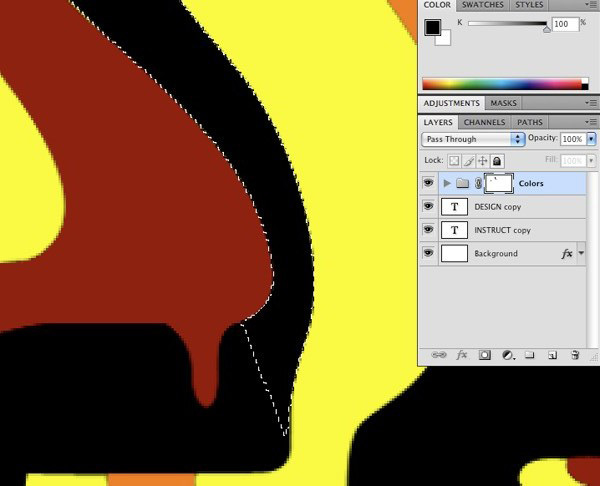 If you’ve kept your similarly colored layers together, then I’ll tell you another way you can speed things up when airbrushing your shapes. Say we want to add some highlights to our orange shapes. What we can do is, first, Cmd-click/Ctrl-click on its layer’s thumbnail to put a selection around all the orange shapes. Doing this will place a selection around all of your orange shapes. 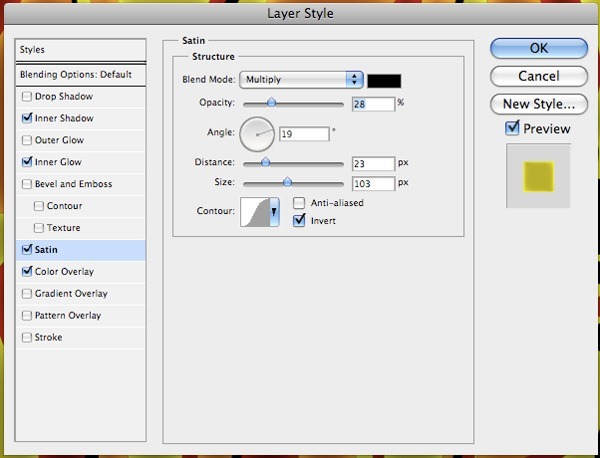 Now, create a new layer at the top of your Layers Panel. Then, go to Select > Modify > Contract. Contract your selection by about 2px. Use a large soft round brush and white (#ffffff) as your Foreground color. 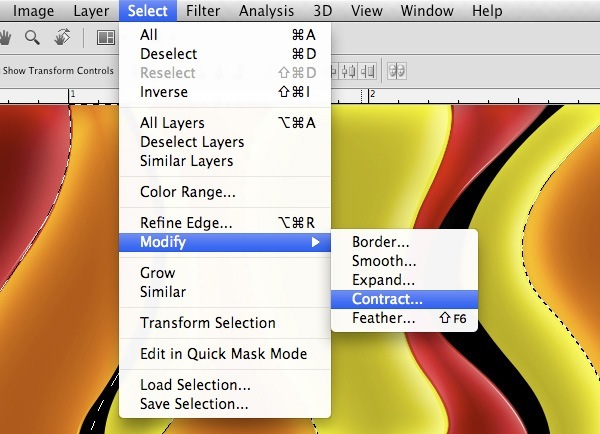 On your new layer, begin to brush just outside of the edges of your selection area. You’ll notice that you can start to build up your highlights inside of your shapes. 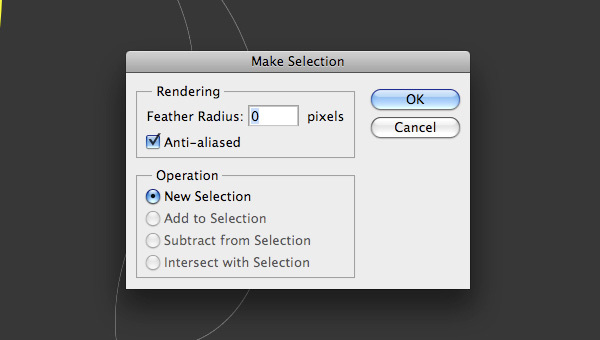 By working this way, you don’t have to create new selections, but instead, use the ones that you have already created. Let’s create some additional contrast in our work. We can do this easily with an adjustment layer. 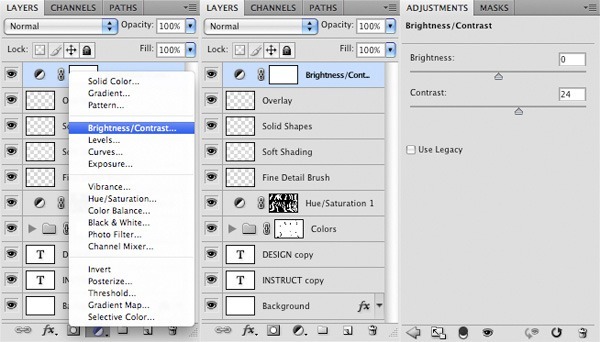 Click on the Create new fill or adjustment layer icon at the bottom of the Layers Panel and then choose Brightness/Contrast in the menu that appears. In the Adjustments Panel, simply slide the Contrast slider up to around 20-25 to boost the contrast of all our colors simultaneously. At this point, feel free to continue adding details and highlights until you’re happy with the results. There’s no exact way to shade in the rest of the design. 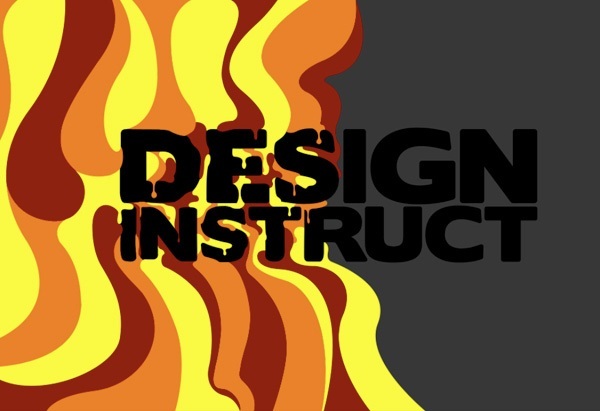 We’ve now come to the end of this graphic design tutorial. I hope that this tutorial has helped you improve your skills with the Pen Tool (P) and that you’ve gained some useful airbrushing techniques.